Xbox 360 is Microsoft’s second video game system, which plays the role of Game Console, HD Movies Player, and music player over the Internet. Do you have compatibility problems with your Microsoft Xbox 360? If yes, you are in the right place to find solutions for all questions about Xbox 360. In short order, the Xbox 360 has taken the gaming world by storm, selling millions of consoles and tons of games to go along with those consoles. It is considered as part of the seventh generation of video game consoles, together with Sony’s Playstation 3 and Nintendo’s Wii. It features Xbox Live which allows users to play games online; download games and game demos; purchase and stream music, television programs, and films through the Xbox Music and Xbox Video portals; and access third-party content services through media streaming applications. Q: I know the xbox 360 can play dvd’s, but is there any way i can rip the dvd’s to the hard drive similiar to how you can put games on the hard drive or download movies form the xbox live marketplace to the hard drive? A: Back up DVD to Xbox 360 video formats and stream the copied video to Xbox 360. This is the common way we use for personal DVD Backup. Here is the solution. Q: Recently I bought a few 2D and 3D Blu-ray discs, and I also have a Xbox 360. I would like to play the Blu-ray disc on my TV through Xbox 360. What can I do? Any software suggested? A: As we know, the PS3 can play Blu-ray Disc directly, but the Xbox 360 can’t. If you want to watch your favorite Blu-ray movie on Xbox 360, you need to convert Blu-ray to Xbox 360 supported format for playback. Q: I have a number of old iso movies that I created at my home. Is there any way for Xbox 360 to play the .iso image file? I want it to play the same way as it played on PC. A: Because Xbox 360 only supports some special containers like AVI, WMV, MP4, MOV and so on, most of times you should rip ISO to Xbox 360 playable format before play ISO on Xbox 360. 4. Recommendations for watching video on Xbox 360? Q: I would like to play my donwnloaded movies on my new Xbox 360. Any recommendations would be highly appreciated. A: If the video is not encoded with Xbox 360 compatible codec, we will fail to stream your videos to Xbox 360 or cannot play them on Xbox 360 even if successfully transferred to Xbox 360. In this situation, there is no other ways but to transcode video like MP4, Gopro video to Xbox 360 for successfully playback. 5. Why can’t I import iTunes media onto a Xbox 360? Q: I got a new Xbox 360 recently and was wondering how to transfer my purchased HD movies and TV episodes from iTunes to Xbox 360 for playing. I have tried to import the media directly from iTunes to Xbox 360 but failed. Is it possible to stream iTunes videos to Xbox 360? If so, what shall I do? A: Well, media content like movies, TV shows purchased or rented from iTunes are encrypted with DRM protection. That’s to say, you are not allowed to directly transfer movies from iTunes library to Xbox 360 or any other non-Apple devices for watching unless you strip the DRM lock from iTunes movies and TV shows while change iTunes M4V videos to Xbox 360 supported DRM-free formats. Which is the best tool to convert Blu-ray, DVD, video and edit them before copying to Xbox 360? 1. Top Blu-ray Ripper: For people who want to transfer Blu-ray movies to Xbox 360, you may need to roll off disc protection, choose target video format and adjust the best video size/bitrate/frame rate for Xbox 360. 2. 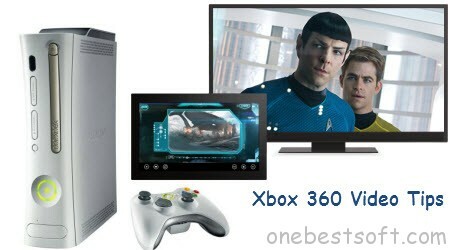 Top DVD Ripper: You cannot miss a DVD to Xbox 360 Converter if you want to move DVD to your Xbox 360. 3. Top Ultimate Video Converter: Need an excellent all-in-one solution to convert any media files, including rental or purchased Blu-ray, DVD, HD videos from Camcorders, all standard videos, online YouTube videos, TV shows, movies downloads etc for playing on Xbox 360? All these can be solved with an easy-to-use video and audio converter. 4. Top DRM Removal: We can’t sync iTunes purchased or rented TV shows to Xbox 360 because of the Apple’s Fairplay DRM protection unless we have a DRM converting tool to strip the iTunes DRM protection, and then do an iTunes m4v to Xbox 360 compatible formats recording without quality loss.